The Denver Pioneers are the sports teams of the University of Denver (DU). They play in the National Collegiate Athletic Association (NCAA) Division I, Denver is a member of The Summit League for men's and women's basketball, swimming and diving, men's and women's soccer, tennis and golf for both men and women, plus women's volleyball. Other DU teams play in various conferences in the sports that are not sponsored by The Summit. The men's ice hockey team is a charter member of the National Collegiate Hockey Conference (NCHC), which formed in 2011 with play beginning in 2013. The lacrosse teams for men and women are members of the Big East Conference; the men began Big East play in the 2013–14 school year (2014 season), while the women left the Mountain Pacific Sports Federation (MPSF) after the 2016 lacrosse season. Men's and women's skiing compete in the Rocky Mountain Intercollegiate Ski Association, while the women's gymnastics team became an affiliate of the Big 12 Conference starting with the 2015–16 season. The University has been fielding athletic teams since 1867. DU's athletic teams are known as the Pioneers. In the early years of competition from the 1860s to the early 1920s, Denver had no official nickname, but sports writers of the day referred to Denver teams as the "Ministers" or "Fighting Parsons" in homage to the Methodist heritage of the school. Denver officially became the "Pioneers" in 1925, after the result of a student nickname contest, and that nickname has been in place ever since. With over 200 All Americans, 31 NCAA Championships, and 65 Olympians in its history, there is a long tradition of excellence in Pioneer sports. Today, DU operates a full NCAA Division I athletic program with a unique and successful mix of sports in and around the $85 million Daniel Ritchie Center for Sports and Wellness, which was completed in 2000. In 2014, Denver was 43rd overall in the Learfield NACDA Director's Cup, which ranks NCAA Division I programs on total athletic program achievement, and was first among NCAA D-I schools without football programs (D-I AAA) for the seventh time in the last eight years (2015). Sports Illustrated ranked the DU program 23rd in the nation in 2008 among all schools. ↑ Skiing is technically a men's sport, but it has been co-ed since 1983. Denver competes as a member of the Rocky Mountain Intercollegiate Ski Association. ↑ The ice hockey team competes as a member of the National Collegiate Hockey Conference. ↑ The gymnastics team competes as an Affiliate member of the Big 12 Conference. 1 2 Men's & women's lacrosse compete as Associate members of the Big East Conference. DU began playing basketball in 1904, playing regional schedules until after WWII, when it became an NCAA independent Division I program until 1979. In 1979, under financial pressure, DU joined the NAIA where it played until 1992, when it joined the NCAA again as a Division II program. In 1999, the program returned to NCAA Division I, when it became a member of the Sun Belt Conference until 2012, when it joined the Western Athletic Conference for one season before joining the Summit League in 2013. The men's basketball team won the 2013 WAC regular season Co-Championship and also made it to the second round of the 2013 National Invitation Tournament (NIT) after defeating Ohio, but losing to Maryland in Round 2. Denver also appeared in the 2005 NIT, losing to San Francisco (after it won the Sun Belt West Division), and also appeared in the 1959 NIT, losing to NYU. Ice hockey is DU's flagship spectator sport, regularly selling out the 6,026 seat Magness Arena on campus, the showpiece of the Ritchie Center for Sports and Wellness (completed in 2000). DU's Hockey Program has been playing NCAA Division I hockey since 1949-50. The Pioneers are one of the most successful programs in the history of collegiate hockey. They are ranked third in all-time NCAA National Hockey Championships with seven (1958, 1960, 1961, 1968, 1969, 2004, 2005) after Michigan and North Dakota with nine and eight championships, respectively. The Pioneers have appeared in 14 NCAA Frozen Four Championships. Since the creation of the Western Collegiate Hockey Association in 1959, the Pioneers have won 10 WCHA Regular Season Championships (now the recipients of the MacNaughton Cup) and 13 WCHA Playoff Championships (now the recipients of the Broadmoor Trophy). University of Denver (in white) men's ice hockey vs Rensselaer Polytechnic Institute (in red), Magness Arena, Denver, Colorado, USA. DU won 3-0 in this regular season opener. 17 October 2014. Denver's ice hockey alumni include 70 NHL hockey players, including Hall of Famer Glenn Anderson, and current (2015) NHLers: 2007 Calder Trophy nominee Paul Stastny of the St. Louis Blues, Tyler Bozak of the Toronto Maple Leafs, Jason Zucker of the Minnesota Wild, Beau Bennett of the Pittsburgh Penguins, Joe Colborne of the Calgary Flames. Patrick Weircioch of the Ottawa Senators, Chris Butler of the St. Louis Blues and 2006 Hobey Baker Memorial Award Winner Matt Carle of the Tampa Bay Lightning. Previous DU players who starred in the NHL besides Anderson include Keith Magnuson, Craig Patrick, Cliff Koroll, Peter McNab, and Kevin Dineen, who coached the Florida Panthers of the NHL until 2013. Legendary hockey coaches at Denver include three former NHL players - Murray Armstrong, Marshall Johnston and Ralph Backstrom. George Gwozdecky, who left the team in April 2013 after 19 seasons, is the only person in NCAA history to win Division I Men's Hockey National Championships as a player (with Wisconsin in 1977), an assistant coach (with Michigan State in 1986) and as a head coach (with Denver in 2004 and 2005). Jim Montgomery a former NHL player, USHL GM/coach and star collegiate player, is the new coach of Denver Hockey, starting in the spring of 2013. DU hockey entered a new era in 2013 when it left its longtime home of the WCHA to launch the National Collegiate Hockey Conference (NCHC). The new conference was formed as a direct reaction to the Big Ten Conference's announcement that it would start a men's hockey league in 2013. The six charter members of the NCHC—DU, Colorado College, Miami (OH), Minnesota–Duluth, North Dakota, and Omaha—have combined for 17 NCAA championships in the sport. These schools were soon joined by St. Cloud State and Western Michigan to bring the league's membership at launch to eight. The Pioneers men's and women's ski teams are honored at the White House by President of the United States George W. Bush in June 2008 for their winning the 2008 National Collegiate Athletic Association team championship, their nineteenth skiing national title. Skiing is another strong sport. The University of Denver Ski Team has won 23 NCAA titles (more skiing titles than any other school). The Pioneers have won nine championships since 2000. DU won NCAA titles in 2014 and 2016, "three-peated" NCAA titles in 2008, 2009 and 2010, won an NCAA title in 2005 and as well as three consecutive NCAA titles from 2000 to 2002. 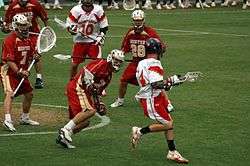 The Denver men's lacrosse team appeared in the 2006, 2008, 2010, 2011, 2012, 2013, 2014, and 2015 NCAA Tournaments. Denver won the NCAA men's lacrosse championship in 2015. It was the first-ever men's lacrosse championship by a school outside the Eastern Time Zone. Denver also appeared in the Final Four three other times in the 2010s. In the Pioneers' first three Final Four appearances, they lost in the semifinals to Virginia in 2011, Syracuse in 2013, and Duke in 2014. Their championship breakthrough came against Maryland with a 10–5 win in 2015. Women's lacrosse played in the Mountain Pacific Sports Federation through the 2016 season, and progressed to the Sweet 16 of its two NCAA appearances in 2013 and 2014. Starting in the 2017 season, the women's lacrosse team will join the DU men in the Big East. Football was once the most popular sport at Denver. The first DU football game was played in 1885 against Colorado College, which is believed to be the first intercollegiate football game played west of the Mississippi River. DU's football highlights include appearances in the 1946 Sun Bowl, 1947 Alamo Bowl, and 1951 Pineapple Bowl. The football team played in a 30,000 seat stadium that stood on campus from 1926 to 1971. However, the program was discontinued in 1961 for financial reasons. The women's gymnastics team has been to 14 straight NCAA Regional tournaments and finished 12th at the 2008 NCAA National Championships and 10th in 2007. The team is a member of the Big 12 Conference after moving from its former home of the Mountain Rim Gymnastics Conference in 2015. The DU men's and women's tennis teams are consistently ranked in the top 35 to top 70 of all Division I collegiate tennis teams. The men's team has produced All-Americans, including a Men's Singles player ranked 11th in the country, and the team broke into the top 25 during the 2010 season. The men's team upset regional #1 seed Florida in the first round of the 2013 NCAA Tournament. The DU women's soccer team advanced to the Sweet 16 of the 2012 NCAA Women's College Cup Tournament, and have also appeared in the 2006, 2007, 2008 and 2009 and 2013 NCAA Tournaments. The women's basketball team appeared in the 2001 NCAA Tournament, where it lost to Virginia Tech in the first round. The women's volleyball team made its first-ever NCAA tournament appearance in 2014, after winning the Summit League title, but losing to Colorado State in Fort Collins in the NCAAs. The women's golf team finished 5th in the 2009 NCAA tournament and have also been in the 2008 (6th) and 2007 (14th) NCAA finals, as well as multiple NCAA regionals. Denver's first athletic event was in a baseball game in 1867 (a loss to the Arapahone Baseball Club), a sport that was played at the varsity level until 1999 when DU returned to full NCAA D-I status. Other notable Denver sports alumni include former Major League Baseball player Dan Schatzeder, NBA basketball players Vince Boryla and Byron Beck, CFL Hall of Famer and former NFL football player Sam Etcheverry, 1952 US Olympic Long Jump Gold Medalist Jerome Biffle, former US Olympic Committee Executive Director Lyman Bingham, and MLS/US National soccer player Nat Borchers. San Antonio Spurs head coach Gregg Popovich received a master's degree from DU but did not play any varsity sports there. Five-time world champion and US Olympic figure Skating star Michelle Kwan graduated from DU in 2009. Former DU basketball player David Adkins went on to greater fame outside of sports as comedian and actor Sinbad. As of March 13, 2016, the University of Denver has 31 NCAA team national championships. Note: Skiing was a men's NCAA sport from 1954–82 and became co-ed in 1983. The AIAW sponsored women's skiing and a national championship from 1977-82 before being superseded by the NCAA, at which time skiing became co-ed. ↑ University of Denver Brand: Visual Guide (PDF). Retrieved 2016-04-16. 1 2 3 Associated Press (July 13, 2011). "New college hockey conference formed". ESPN.com. Retrieved July 18, 2012. ↑ "DENVERPIONEERS.COM THE UNIVERSITY OF DENVER OFFICIAL ATHLETICS SITE". CBS Interactive. Retrieved May 21, 2015. ↑ "St. Cloud St., W. Michigan join league". ESPN.com. September 22, 2011. Retrieved July 18, 2012. ↑ "Denver to have stadium". Pittsburgh Press. December 22, 1924. p. 32. ↑ "Denver bids to stage East-West Classic". Reading Eagle. Pennsylvania. INS. December 15, 1941. p. 15. ↑ "Denver University drops football". Spokesman-Review. Spokane, Washington. Associated Press. January 10, 1961. p. 14. ↑ "Summary–(NCAA) All Divisions/Collegiate Total Championships" (PDF). Retrieved 2015-02-02.